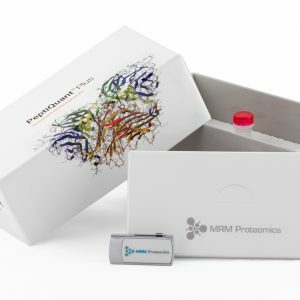 The PeptiQuant™ Quality Control kit line is a series of easy-to-use kits to assist in quality control of quantitative MRM-MS proteomics workflows. 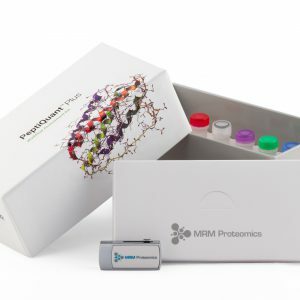 Whether you are running your first PeptiQuant™ MRM-MS Bioassay Kit or you have been running your own MRM-MS proteomics assays for decades, our PeptiQuant™ Quality Control products are there to help ensure that your proteomics workflow and instrumentation is up to standard for every sample you analyze. PeptiQuant™ LC-MS Everyday Platform Performance Kits offers everyday quality assurance in the form of a ready-to-use standard mix that can be quickly re-suspended and injected for routine instrument performance monitoring. The Everyday Platform Performance kit makes it easy to recognize retention time drift or changes in instrument performance. to standardize your implementation. It is also useful to measure operator and instrument performance and to facilitate troubleshooting.